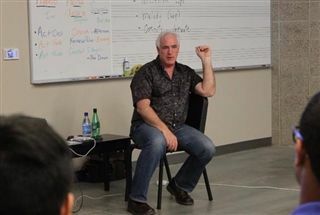 On Tuesday, February 9th, music composer Larry Groupé presented to Vocal Ensemble students about the creative, logistical and business aspects of composing scores for film and TV. Mr. Groupé has won Emmy awards for his scores to the documentary films Jonas Salk: Personally Speaking and Residue. He also wrote the score for the 2000 film, The Contender, which starred Joan Allen, Gary Oldman and Jeff Bridges.